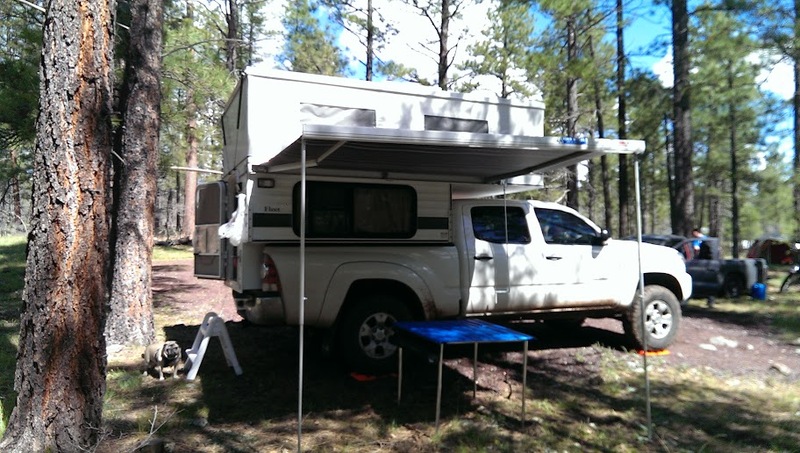 There is something to adventure traveling that brings people who normally seek solitude to a large group gathering such as the Overland Expo at Mormon Lake, Arizona. We share stories, validate our experiences, learn new tricks and tips. It is a recharging, of sorts, and it’s just plain fun to see the crazy overlanding vehicles that attend the Overland Expo. 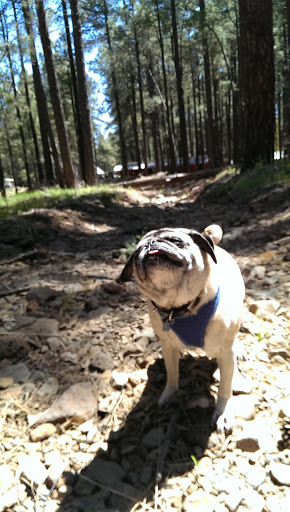 Pugsly and I left early Thursday morning to drive the couple of hours up to Mormon Lake, Az. She wasn’t too excited about this. When we arrived, the volunteer camping area was across the road from the main event areas. It was a beautiful spot up in the woodsy area. Not great for my solar collecting, but listening to the wind in the trees after dark while lying in bed was worth conserving my power usage. The Expo was spread out over what looks like a large area, but was very walk-able. That said, next year I’m definitely bringing my little dual-sport motorcycle or a bicycle. Or both. It was a bit of a hike to get to the entrance, then a lot of walking within the event itself. Do-able, but my feet were not happy, especially after four hours standing up checking people in at HQ each morning. When I was here a few years ago, I had my motorcycle (DR350) so the foot-ow was a non-issue. Oops. This year, I volunteered to help out. The benefit was that I got to “audit” the presentations, movies, and hands-on part of the event (except that I didn’t do any of that) and camp for free. I volunteered to be part of the First Aid tent. With my EMT training, and continued CPR/First Aid certifications, I qualified. However, at the last-minute, I was moved to “HQ” to check people in to the event. That was barely managed chaos. Which, luckily, I thrive working in. One of the big highlights of my trip was getting to meet and visit with Tom Hanagan – the owner of Four Wheel Campers (FWC). Out of all the amazing adventurers I met, and sights I saw, it might seem odd that meeting the guy who runs a company of the camper I own was a highlight. But this little camper is my part-time home, it is what helps to keep me sane in this fucked up world, it enables me to escape the day-to-day doldrums. This soft-spoken man is inventive, innovative, and has created a family-like community around these truck campers. I was lucky to have spent some quality time with Tom. We talked business, campers, and aesthetic philosophies. We discussed getting older and meditated on idea of ‘time’. He and his generous crew fed the lot of us – and there were a lot of us! FWC invited their customers to camp with them. I don’t have a photo of their spot, but at the FWC booth was the display models, a large tent / gathering area, and many FWC campers set up. We all spent a fair amount of time lounging and swapping stories in camp chairs in-between the truck campers. I got to tour some of the other same-model campers and see what all folks have modified or changed. It’s always difficult to do everything you want at this kind of event. I was lucky to be able to spend time with my friend, and Guinness Book of World Record holder, Danell Lynn. I love touting friends’ accomplishments! She is about to embark upon another incredible adventure with a couple of other adventurers. 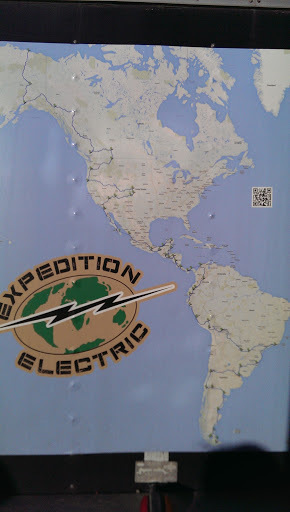 The trip is called “Expedition Electric” and they are riding electric motorcycles from northernmost Alaska to the tippy tip of South America! WHOA! Danell and I went to check out the team’s digs. 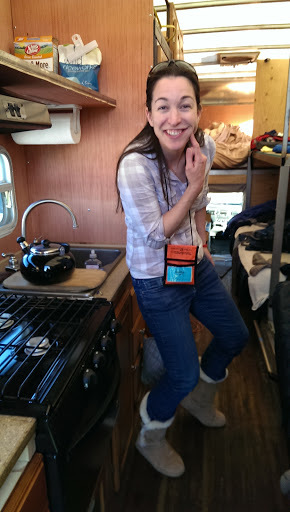 After having ridden 50+ thousand miles around the U.S. alone on her motorcycle, she was child-like excited to have a kitchen that will be traveling with them. Pugsly wasn’t too happy that I left her in the camper for so many hours alone while I was off gallivanting around doing volunteering and visiting with friends, but she and I got some lovely time together in the woods. It was very cool (chilly, even) this weekend and breezy to the point of knocking over large group tents! 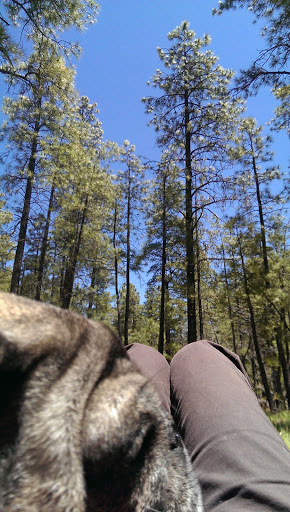 The sun felt so good during that chilly weekend, that we (I) took a little nap on the forest floor. Pugsly only sneezed on my face a few times. I had the intention of buying at least a couple of things I wanted for my camper and truck. I ended up only buying three things while I was there: a delicious falafel from one of the food trucks, an Overland Expo hat (windy!) 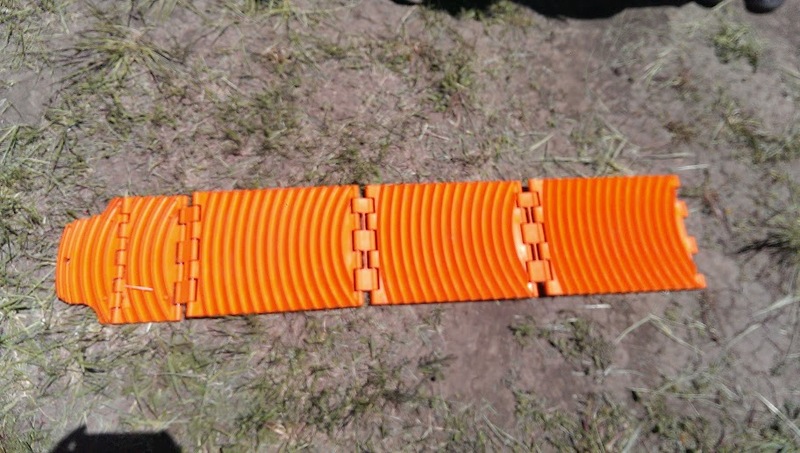 and some traction aids. I’d been eyeballing MaxTraxx, which seem to be the adventurer’s choice of ‘get out of muck’ tools. But they cost $300+. I found this small company’s tent and stopped to chat with the nice couple hosting. 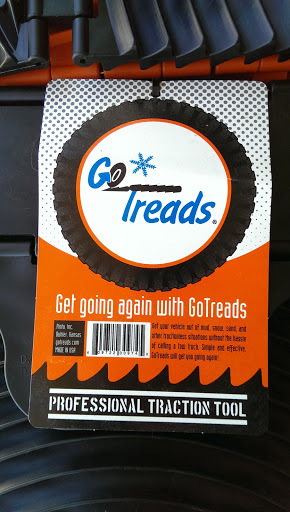 Turned out, the young man’s father invented “Go Treads” and he was carrying on the family business. I sent this photo and a text to a friend of mine who off-roads often and he replied that they looked great, get good reviews, and look like a solid product. $80 got me two sets. They are light-weight and fold up small and model for blurry photos. I now feel much more confident about off-roading in muddy, sandy, or snowy areas! 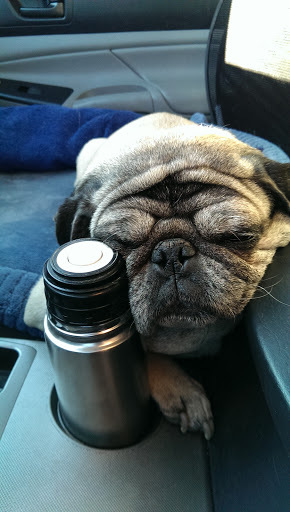 After a bit too much partying on Saturday night at a couple of campsite parties, post-my last volunteer shift, and fighting a pervasive headache… Pugsly and I headed out early Sunday afternoon to go back home.